In non-rhyming verse, Ntozake Shange tells the tells the story of Coretta Scott and the civil rights movement through specifics in Coretta Scott's life from her walk to school to the March on Washington, achieving voting rights and beyond. CORETTA SCOTT does an excellent job in incorporating both Coretta Scott's religious faith and her marriage into the story while simultaneously focusing on Coretta Scott as the central character with power within herself. She is portrayed as a leader in her own right, not just a follower. The author creates a moving portrait of a woman dedicated to prayer and also social action. 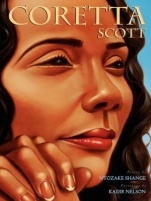 CORETTA SCOTT is not only an excellent biography for children but also a portrait of determination to inspire today's children to persist though adversity towards their beliefs and goals. What a wonderful resource libraries, teachers and individual readers in American history, Black History, and Women's History! The portrayal of the injustices of segregation, both in text and paintings, are powerful in their simplicity and also age appropriate. The author and the artist do not gloss over the trials of the times but disturbingly violent images are absent. The reproductions of the paintings (oil on birch wood) are stunningly beautiful, especially the expressions and posture in the portraits. The poetry flows naturally for reading aloud. At the end of the book, the author includes a prose note detailing more specific details of both Coretta Scott and Martin Luther King, Jr. lives and work for children interested in more information. It would be nice if someday the publisher made an edition with some posters alongside the book for using in the classroom as teaching aids. Very highly recommended!